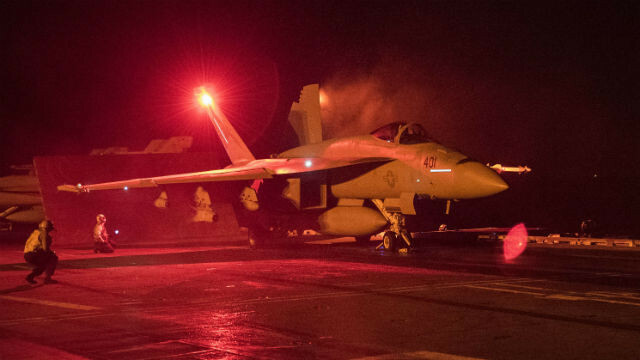 Strike aircraft from nuclear-powered aircraft carrier USS Harry S. Truman flew their first missions against ISIS terrorists Tuesday in support of Operation Inherent Resolve. It was the first strike by Navy jets since the San Diego-based carrier USS Theodore Roosevelt left the region in October. The Defense Department reported that U.S. an coalition aircraft conducted nine strikes against targets in Syria and 22 in Iraq. Many of the strikes were near Ramadi, which Iraq forces recaptured from ISIS on Monday. The Pentagon said seven strikes in that area struck five separate ISIS tactical units and destroyed eight ISIS fighting positions, two ISIS oil tanker trucks, three ISIS heavy machine gun positions, an ISIS vehicle, an ISIS front-end loader, an ISIS vehicle-borne bomb, an ISIS sniper position and an ISIS house bomb. The Truman joined the French nuclear-powered aircraft carrier FS Charles De Gaulle in conducting combined combat operations in Iraq and Syria from the Arabian Gulf.